I always listen to music walking to and from work. This evening, as I was listening to my acoustic playlist, it struck me that American Tune by Paul Simon — a beautiful song that is one of my favorites — pretty accurately captures how many people are feeling these days. I’m not just talking about disappointed Hillary Clinton voters, either. There seems to be a strong sense of disquiet, an unsettled feeling, mingled with curiosity, trepidation, raw hope, and uncertainty about what might happen next, lurking throughout the general populace. Some of those feelings stem from the election results and the thought of Donald Trump as President, to be sure, but some of them also seem to flow from concerns about the direction of the country as a whole. Where is our road leading? It says something about the universality of music when a song written at the end of the Nixon Administration can so perfectly express how so many Americans are feeling, 45 years later. One last point about the election, and then it’s time to move on: it’s pretty clear that the entire polling edifice about which modern campaigns, and much of modern political journalism, have been built came crashing down Tuesday night. The Hill has an interesting article on the degree of polling failure, with a headline stating that pollsters had sustained a “huge embarrassment” as a result of their general failure to predict, or even detect the possibility of, a Donald Trump win. By way of example, no poll indicated that Trump would win Wisconsin, and instead showed Hillary Clinton with a 6.5 percent lead in that state. As a result, none of the know-it-all pundits who were pontificating on Election Day even identified Wisconsin as a “battleground state” — when in reality Wisconsin may be the crucial state that handed the presidency to Donald Trump. I’ve written before about the many judgment calls that go into polling, and how a few tweaks in turnout modeling and the demographic makeup of “likely voters” can change the results. With this election, we’ve seen the suspicion that polling is not quite as “scientific” as we’ve been led to believe become a painful reality. Pollsters were just wrong in predicting who would turn out, and in what numbers, and as a result their numbers were skewed — which is why the ultimate results were such a shock. Polls have become a crutch for campaigns and journalists, and also have been used to crush the aspirations of challengers out seeking to raise money. Maybe now the “national media” covering the elections will actually get out on the campaign trail, go to events, and report on what the candidates are actually saying and how their audiences are reacting, rather than reporting on polling data and insider leaks about the shape of the horse race. Maybe now campaigns will pay more attention to what people on the ground are saying and doing, and whether they are responding with enthusiasm to a candidate’s message. And maybe people deciding which candidate to vote for or financially support will pay attention to the candidates themselves, rather than trying to pick a likely winner based on polling data. I would never say that this awful election had a positive impact on anything, but if it results in our political processes being much less poll-driven, that would be a step in the right direction. My autumnal allergies hit on Monday afternoon and were raging at full force yesterday. I was sneezing uncontrollably and my nose was running to beat the band, too. Last night, after Kish and I settled down to watch the election returns, I felt exhausted and miserable, so I went to bed before 9 o’clock. At the time, the voting data was showing an enormous turnout of new Latino voters, exit polls were indicating that Hillary Clinton was outperforming President Obama and Donald Trump was underperforming Mitt Romney in key demographics, and the network pundits were confidently predicting a smooth ride to a Hillary Clinton victory. When a fit of sneezing and coughing woke me up six hours later, as Kish was turning in, the New York Times and the Washington Post were calling the election for Donald Trump. Trump had won Ohio and Florida, but he had also eked out victories in Wisconsin and Pennsylvania. (Pennsylvania?) I felt like I had gone to bed in the normal world and awakened in some bizarre alternative universe. It’s the most astonishing turn of events I can remember. So now we are at the morning after. The election is finally over, and we have a President-elect who seems remarkably ill-suited for the job in just about every category you can think of. We’ll see shock from foreign governments overseas, and a drop in the stock market because of the utter uncertainty about what a Trump presidency might mean, and amazement in other places as people struggle to process a result that no one expected and no polls foresaw. We will hold our breath and wonder who our new leader will enlist to fill Cabinet positions, and staff the White House, and perform the countless other tasks that new Administrations must undertake. And the Republicans who control both the House and the Senate will have to figure out how they are going to deal with President Trump. Many of my good friends are bitterly disappointed and angry, and are wondering whether this country has changed in some terrible and fundamental way. I hope we all can take a deep breath and hold our fire for a few days before equating the voters from the states that voted for Trump with Nazis or knuckle-dragging ignorants. 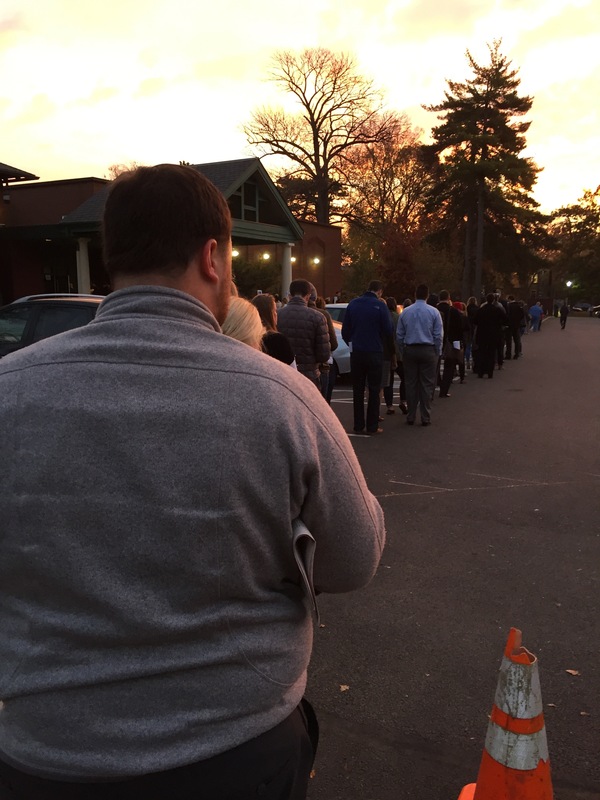 Some of the people who stood patiently with me in long lines yesterday, waiting to vote, must have been Trump voters (he won Ohio by 8 points) and they weren’t ogres. Obviously, something motivated them to overlook Trump’s shortcomings and vote for a person who is the most improbable President-elect of the modern era, by a factor of ten. We need to understand what that motivation is. The period between now and Trump’s inauguration is going to be the most important, and probably strangest, transition period in the history of American politics. We need to figure out how we can get through it without tearing our beloved country apart. 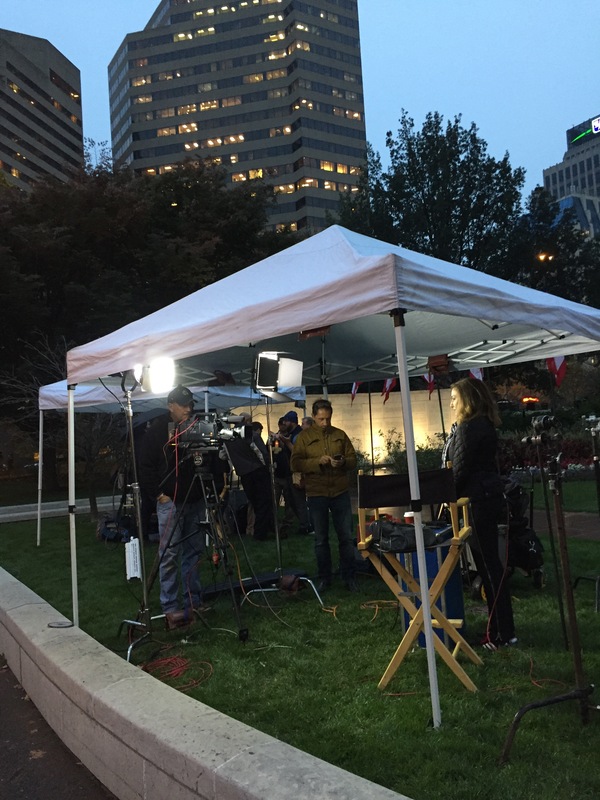 Ohio might not be the hottest battleground state this time around, but that doesn’t mean that the news media is uninterested in the Buckeye State. 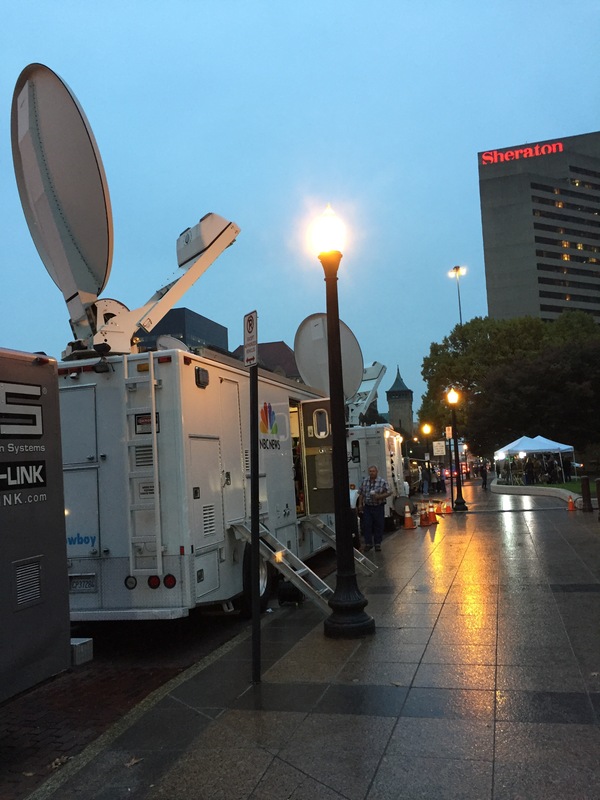 Along Third Street, in front of the Statehouse, are the antenna trucks and equipment trucks and multiple tents to protect the talent from the rain. It’s weird to see these network reporters sitting on chairs and standing on boxes, staring intently into monitors, and realize they are talking to people half a continent away.